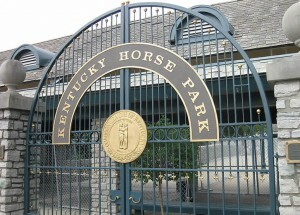 Kentucky Horse Park front gate. Kentucky Horse Park is one of those marvels that many people outside of horses don’t know much about. For many horse lovers, going to KHP is like attending the Super Bowl for the first time, or going backstage to meet a rock star. Or maybe it’s more like Disneyland for horse enthusiasts. The land that KHP stands on has been home to horses for more than two centuries. The original 9,000-acre tract was deeded by the governor of Virginia, Patrick Henry, to his brother-in-law in 1777 and it changed hands many times over the next 200 years. The land was subdivided by various owners and used for breeding Thoroughbreds, Standardbreds, and Saddlebreds. During the 1970s, Thoroughbred breeding farms in Kentucky began to close their doors to visitors, but Thoroughbred breeding and racing were still important parts of the state’s economy. In order to promote Thoroughbred racing to the world year-round, two Lexington locals, breeder John Gaines and civil servant James Host, suggested creating a park dedicated to Thoroughbred horses and the Bluegrass State. Eventually it was decided that the park would focus on all breeds of horses. In 1972, 1,200+ of the original 9,000 acres were sold to the Commonwealth of Kentucky, which developed the land into Kentucky Horse Park for $28 million. It opened to the public in November 1978. The original Kentucky Horse Park included a movie theater with a wrap-around screen that featured the Techniscope film Thou Shalt Fly Without Wings, a museum with restored horse-drawn vehicles, historical dioramas featuring life-like taxidermied horses, and a monument to Man O’ War. But the pièce de résistance was the FEI World Eventing Championship held at KHP in September 1978, two months before the park opened for visitors. Originally, the television networks wanted the park to pay them for airing the championship, but once they learned more about the event and KHP, the networks were willing to pay the park for the broadcast rights. In the early days Kentucky Horse Park was sometimes called a “white elephant” for being a costly government project, but with continuing investment and visionary development KHP has become an important part of Kentucky’s economy. Annual tax revenues generated by KHP are estimated to be around $250 million and the park welcomed over 1 million visitors in 2010. KHP’s success story has inspired the state of New York to develop its own plan for a horse park. In 2010 the Alltech FEI World Equestrian Games were held at KHP and generated more than $200 million for the local economy. 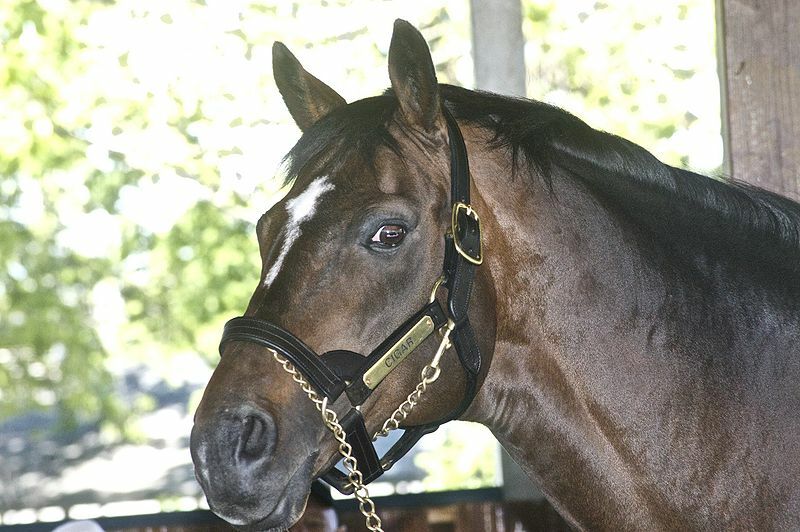 Today, Kentucky Horse Park is like Mecca to many horse fans. There are 13 life-size bronze sculptures of legends like Secretariat, *Bask, Supreme Sultan, Man O’ War, and Misty of Chincoteague. The farm is home to famous real horses as well — Cigar, twice Thoroughbred racing’s Horse of the Year, and Kentucky Derby winner Funny Cide are pampered and adored by fans at KHP. There are nearly 50 different breeds represented at the horse park. The International Museum of the Horse features historical exhibits, including horses in Imperial China and in the British Isles. In addition, there’s a new 8,000 square foot exhibit called the Al-Marah Arabian Horse Galleries that has a movie theater, several famous paintings and bronze sculptures of Arabians, and history and culture of the Arabian breed. The American Saddlebred Museum is also on the premises and features Saddlebred history and an annual art auction. The Maker’s Mark Secretariat Center at KHP rescues retired racing Thoroughbreds and raises awareness about their value as riding horses. There are also 30+ equine associations based at KHP, like the American Hanoverian Society and the U.S. Dressage Federation. KHP even has a campground with special events for those who like to rough it, and you can bring your horse with you too. July 15-17, 2011, KHP will once again host Breyerfest, the annual model horse event that attracts thousands of collectors from around the world. 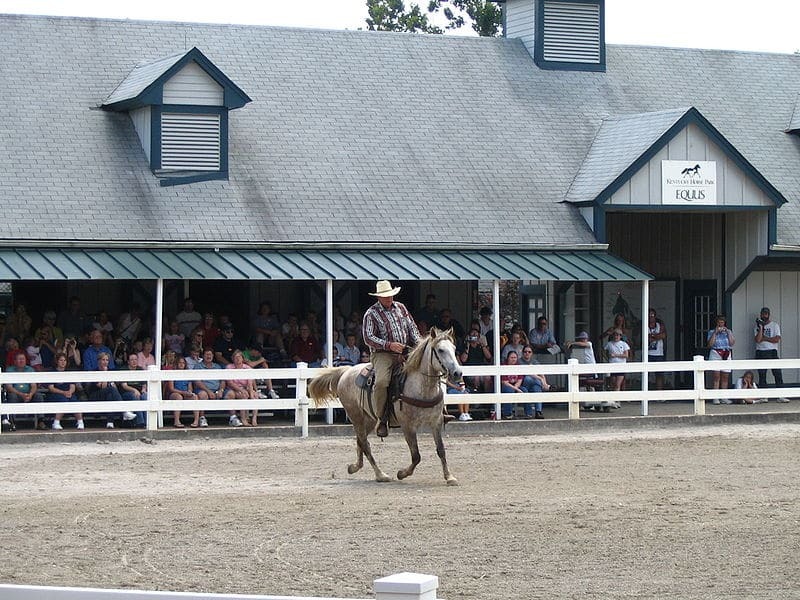 Events include model horse shows, seminars, an auction, exclusive sales, and real horse performances. Back in 1997 I was a radio show guest on The Horse Show with Rick Lamb discussing the issue of show horse abuse in Arabians. Since then, Rick’s show has grown a lot and can also be found on TV and podcasts. 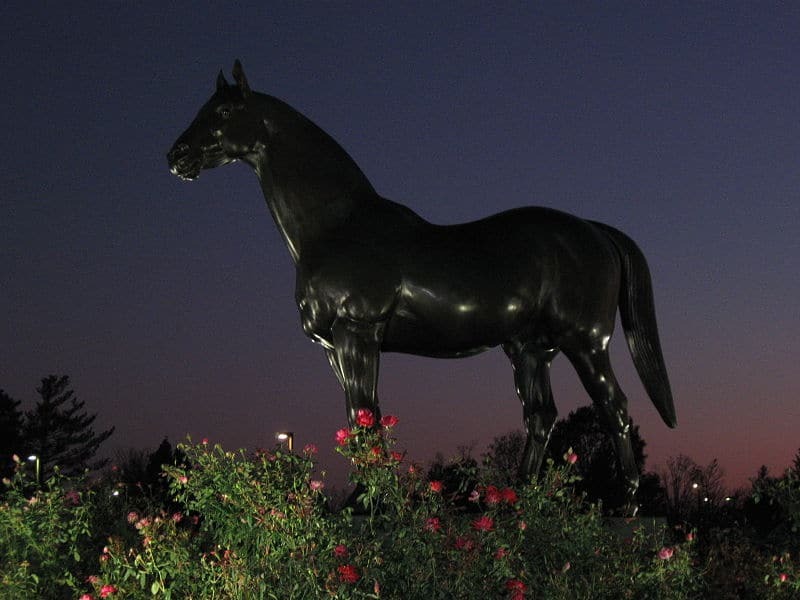 Below is Rick’s 26-minute TV episode about the historical exhibits at Kentucky Horse Park. Enjoy! Da Vinci’s dream of a 24-foot-tall horse statue took 500 years to become reality. The American Horse statue at Meijer Gardens in Grand Rapids, Michigan. Around 1482, the Duke of Milan, Ludovico Sforza, commissioned Leonardo da Vinci to create the largest bronze horse statue in the world. Not only did its sheer size make it a tremendous challenge for da Vinci, but the artist was also busy creating The Last Supper and working on a variety of other projects for his patrons. 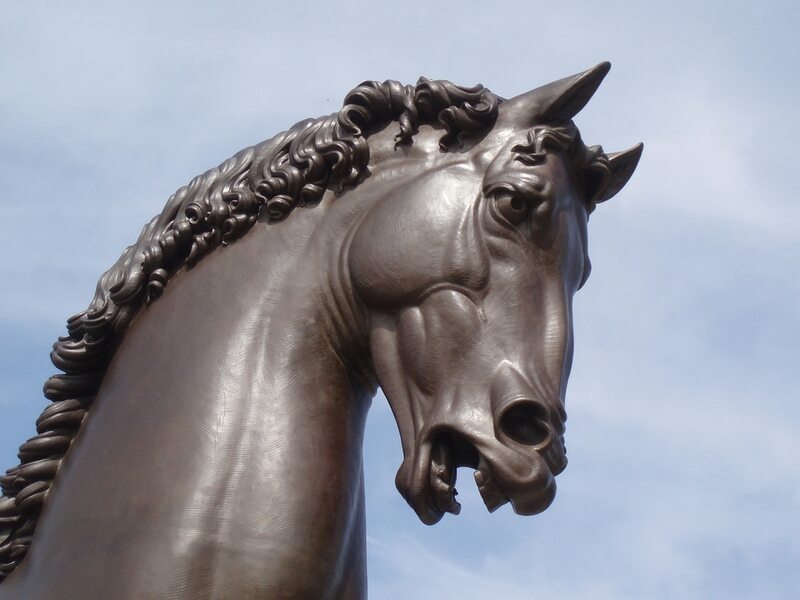 A 24-foot-tall clay model of the horse statue, named Gran Cavallo, was unveiled in 1493. Over the previous 10 years, da Vinci had been busy collecting 58,000 pounds of tin and copper for the eventual casting of the sculpture, but a French invasion put his plans on hold. The tin and copper were made into cannons and the huge clay model was destroyed in 1499 by French soldiers. 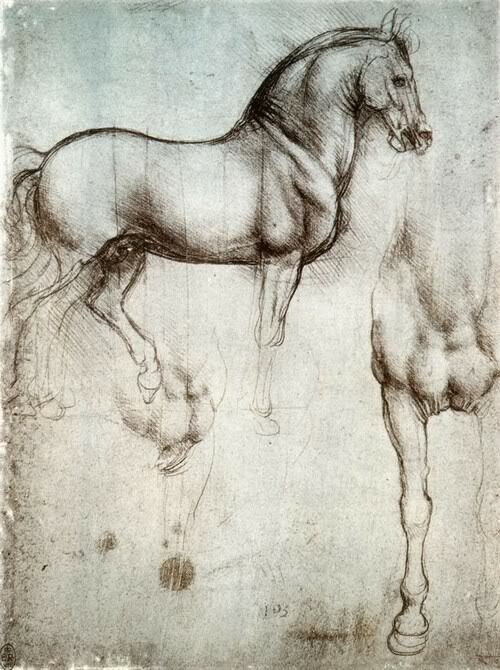 Da Vinci fled Milan, reportedly with a broken heart at knowing his great horse would never be made. One of da Vinci's early sketches of the Gran Cavallo statue. Nearly 500 years later, an American retired airline pilot named Charles C. Dent read the story of “Leonardo’s horse” in a 1977 issue of National Geographic and was inspired to make the enormous statue a reality. His dream was to create the world’s largest bronze horse statue, which he named Il Cavallo, and give it to the city of Milan. He sought donations and advice from various scholars on whether the full-size statue was feasible. In 1982, he established the nonprofit Leonardo da Vinci’s Horse Inc. to ensure the project’s completion. Dent died in 1994 but the project continued to move forward. A new sculptor, Nina Akamu, was brought in to create a new eight-foot-tall master model in 1997. Billionaire Frederik Meijer (of Meijer supermarket fame) got involved around that time and offered to finance the creation of an identical statue that would remain in the U.S. 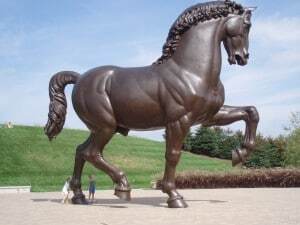 It was agreed that the copy, called American Horse, would stand in the Frederik Meijer Gardens in Grand Rapids, Michigan. Meijer’s financial contribution helped to ensure that the entire project, including the statue to be given to Italy, would be a success. The first 24-foot statue was unveiled in Milan, Italy, on September 10, 1999 — exactly 500 years after da Vinci’s first clay sculpture was destroyed by invading French troops. The second horse was presented to the public at Meijer Gardens on October 7, 1999. The only difference between the two sculptures is that the Italian version stands on a marble base. The project cost about $2.5 million and took 500 years and countless people to come to fruition. A 12-foot bronze replica was dedicated to Charles Dent on October 5, 2002, in Dent’s hometown of Allentown, Pennsylvania. An eight-foot statue was given to the city of Vinci, Italy, the hometown of Leonardo da Vinci, and another eight-foot statue can be seen at the Sculpture Education Center at Meijer Gardens. An eight-foot fiberglass copy travels around the country to promote the project and the friendship between the U.S. and Italy. In all, the project cost about $2.5 million and took 500 years and countless people to come to fruition. The result is the world’s largest horse sculpture and a truly majestic sight. To see photos of all the statues from the Leonardo’s Horse project, visit Travelogue of an Armchair Traveller. Learn about the project’s creation and view a slide show of photos at Da Vinci Science Center.